The reformer makes a dramatic impression when you first see one and an even more dramatic change in the body when you use it. 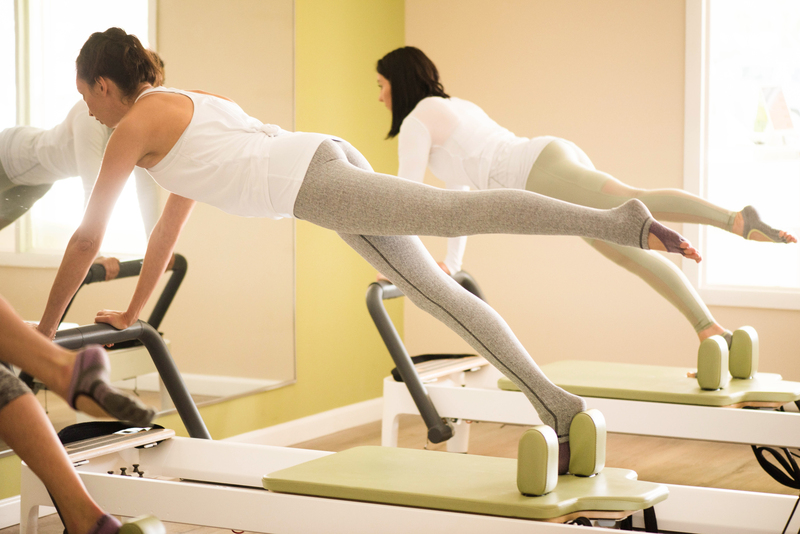 Reformer classes are usually one of the main choices at the Pilates studios. If you would like to improve your performance in all of your physical activities and if you would like to strengthen your core, lengthen your muscles, increase flexibility or If you feel like most of group exercise classes are too difficult and you are afraid to injure yourself while working out, Reformer Pilates is just the thing for you! All of our reformer sessions are individual, therefore they will be specifically designed for you and your fitness needs. The reformer offers all the famous benefits of Pilates besides overall strength, flexibility, coordination, and balance it’s also daily life improvements like better posture, graceful, efficient movement, and for many, relief from pain associated with physical imbalances such as back pain, muscle imbalances, improvement of coordination. Our instructors have a lot of experience in working with people of different fitness levels, abilities or injuries as well as clients of high fitness levels and athletes. That’s no wonder Joseph Pilates, founder of Pilates Method, originally called it Universal Reformer, exercising on it is possible for anyone at any level. Socks with grips on the bottom are required on all equipment at Everbalance for your protection and safety. A private consultation is required before joining the group Reformer class at Everbalance. This would be the perfect class for someone who has never done Reformer Pilates, or Pilates in general before. It’s designed to be slower passed, educational for new practitioners to be comfortable and get the most benefit from their workout. A private consultation is required before joining the group Reformer class at Everbalance. This class is appropriate for everyone who has done Reformer Pilates at least 3-4 times before. Expect practitioners of different levels to be in this class. A private consultation is required before joining the group Reformer class at Everbalance. This class is appropriate for those who have been doing Reformer Pilates for a significant period of time and have a lot of experience in Pilates and are looking to challenge their core strength, balance and flexibility and take it to the new level. Before signing up for Intermediate Reformer Pilates ask any of our studio instructors if this class would be appropriate for you. A private consultation is required before joining the group Reformer class at Everbalance. This class is for intermediate practitioners and is a lot of fun. It includes the elements of cardio done using Reformer Pilates Jump Board, requires some experience on the Reformer. It’s not recommended for clients with neck issues, knee issues, foot and ankle recent injuries. A private consultation is required before joining the group Reformer class at Everbalance. This class offers a great combination of exercises on the reformer as well as, mat and barre. It offers training in body awareness, balance and proprioception off the equipment to apply physical strength for functional movement for every day living.